Robuvit® Oak Wood Extract benefits are many. It has proven in clinical studies that it fights chronic fatigue and related symptoms, boosts cognition, improves mood, and has some important detox benefits as well. PHOTO ABOVE: 100% pure Robuvit® Oak Wood Extract. I have found Robuvit® Oak Wood Extract benefits to contribute to my own health through a few years of using it. As well as the above benefits, this compound was awarded a top prize as a sports supplement. 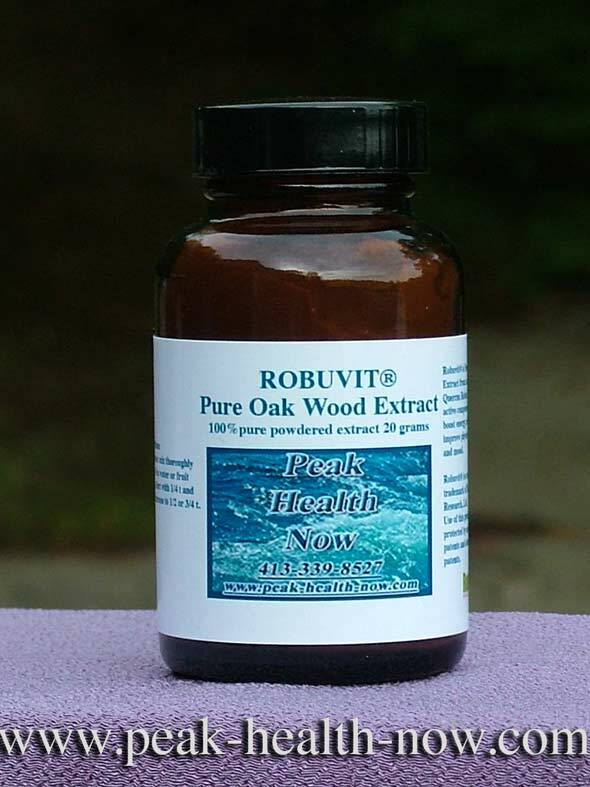 Robuvit® Oak Wood Extract benefits are EASY to obtain! As a simple addition to a cold glass of water, has a pleasant, bracing, slightly astringent, piquant quality. I like 1/4 teaspoon in 4 - 8 ounces water. It is refreshing on a hot summer day, as well as providing a smooth energy boost with no caffeine needed. Interestingly, along with the extra energy, the Robuvit® seems to provide a mellowing effect. There is a feeling of ease it imparts which balances and deepens the experience. Robuvit® is a great choice as a refreshing drink on a Paleo / Ketogenic diet, as it does not spike insulin. I have also used 1/4 - 1/2 teaspoon in coffee enema, which has a similar energizing / mellowing effect. As well, you will find Robuvit® Oak Wood Extract benefits in our new transdermal cream, Nitric Oxide Delight. 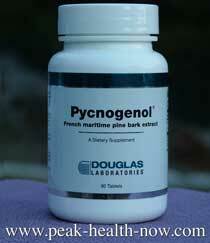 I included it in the formula to balance out the enlivening 'zing' provided by the Pycnogenol® (French Maritime Pine Bark Extract). The Robuvit® has a harmonizing effect that is quite nice. It occurred to me that the so-called 'French Paradox' may have as significant influence the benefits of Oak Wood Extract that insinuates itself into the wine from the oak barrels in which wine is aged. (The French Paradox is so-called because statistically, even though the French eat a lot of high-fat animal foods - for instance pate-foi-gras - goose liver pate,' their rate of circulatory problems is low compared even to some countries that have lower fat diets). Of course, it is now understood by those in the know, that animal fats from healthy sources (grass-fed organic) do NOT contribute to circulatory disease. Stress and carbohydrate consumption DO contribute mightily to circulatory disorders. However, given the amount of wine the French like to consume, it stands to reason that the Oak Wood Extract from the barrels in which it is aged somewhat offset the deleterious effects of alcohol consumption. Robuvit® originates from unique oak tree species : Quercus Robur. “Quercus” is derived from the Celtic "quer" - which mean "fine", and "cuez" - which means "tree". The latin word “robur” means : strength, power, oak, firmness, solidity. The astringent effects of oak wood was known to the Ancients and used in medicine for centuries to fight against fever, hemorrhages, and diarrhea. It is tonic, strongly astringent and antiseptic. It has an astringent bitter taste, slightly aromatic. Among Robuvit® Oak Wood Extract benefits is that it is a powerful natural antioxidant shown to support sports performance and to boost energy in those with fatigue and chronic fatigue syndrome. Clinical studies have shown Robuvit® to provide benefits in various fields of application such as liver function, blood glucose, lymphatic function, homocysteine level (a cardiovascular risk factor) and more. Robuvit® is an amazing ingredient which offers multiple detox benefits. Robuvit® offers a scientific evidence-based, safe, natural, caffeine-free solution to boost energy, reduce fatigue and improve both physical performance and mood. Multiple clinical studies have proven Robuvit® to help with CFS (Chronic Fatigue Syndrome), including symptoms such as loss of memory or concentration, muscle pain, headache, unrefreshing sleep, dizziness, allergies, mood swings, but also physical performances.